Taking place from the 10th to the 12th of February at the Palais des Congrès, Paris, Microsoft TechDays is the most important IT event in Europe and the most renowned among digital professionals. This year Microsoft has well and truly leveraged the power of social networks, with a Social Lounge, Social Reporter, Social Wall and other brand advocacy tools all on the menu. Over the course of three days, TechDays 2015 is expected to attract 18,000 in-person attendees and thousands more on social media- the first day alone drew in 38,000 online participants. 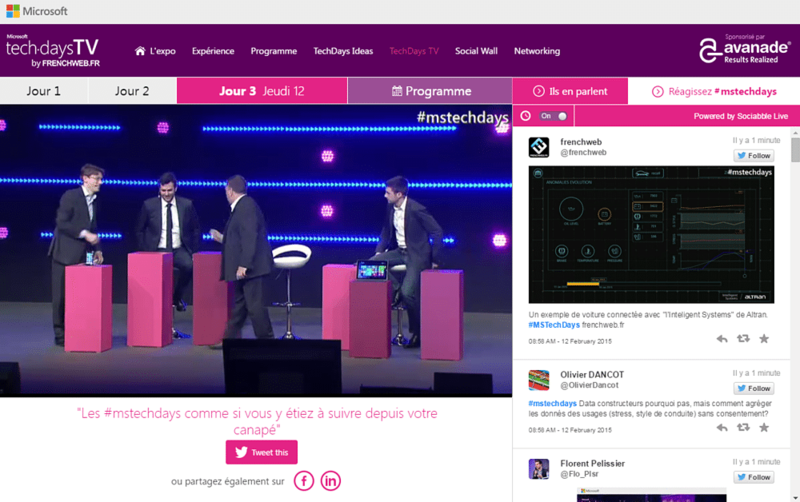 With #mstechdays trending throughout, it is a prime example of how to launch digital brand advocacy initiatives that enhance live events. Ahead of TechDays 2015, Microsoft wanted to leverage its existing community of employee advocates on Sociabble, a brand advocacy platform. 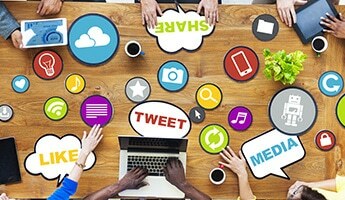 Sociabble aggregates all company social media content on a single, self-refreshing interface. From there, members simply click to share posts on any of their own social networks. Users win points for each piece of content they share; while administrators can launch gamification campaigns and track the diffusion of content. To date, Microsoft has launched Sociabble in several countries, including France and Brazil. 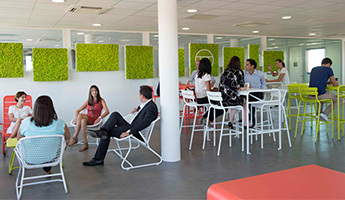 To find out more read the case study, ‘Microsoft France: Leading Innovation on Social Media through Employee Advocacy’. In order to promote TechDays through this extensive community of employee advocates, Microsoft launched a new TechDays channel on Sociabble, with over 100 social network feeds filtered according to event-specific keywords. 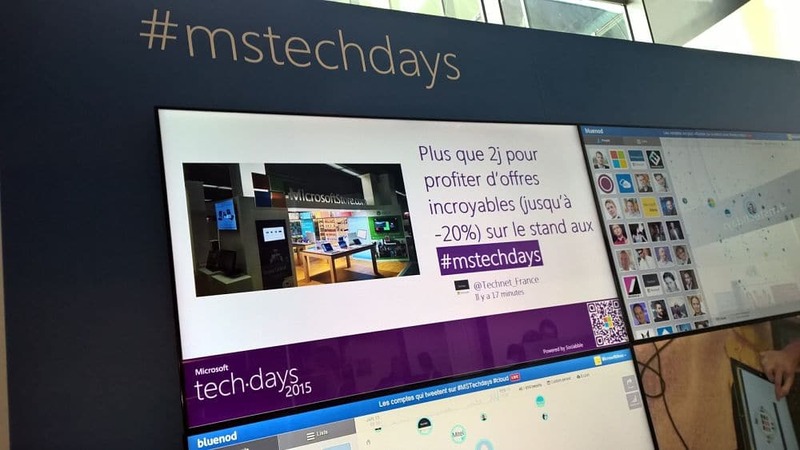 During the lead-up to TechDays, Sociabble gamification functionalities were used to launch challenges and drive sharing activity; boosting the visibility of #mstechdays across all social networks. 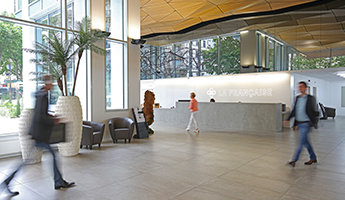 During the event itself, social media teams have been based in the “Social Lounge”; which is located at the heart of the Palais des Congrès. This highly visible zone allows attendees to see community managers at work as they tweet on official feeds, produce content such as infographics, and videos. 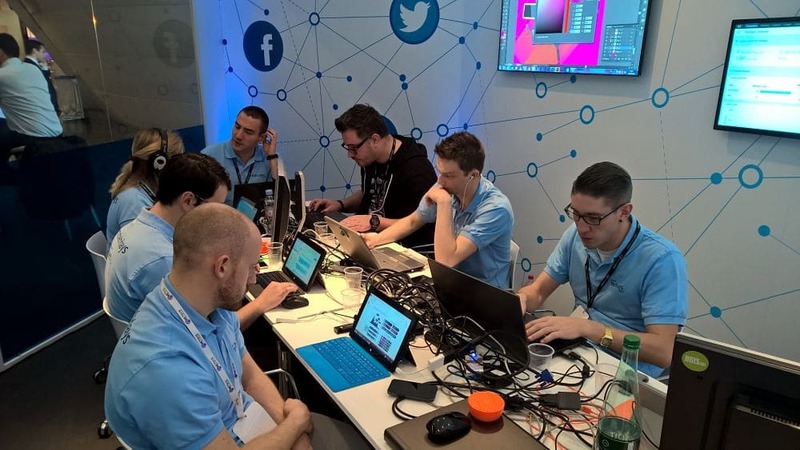 Also, they can carry out social listening surrounding #mstechdays. The social media team is led by a Social Reporter, who is in charge of interviewing guest speakers and influencers during the three-day event. The Social Wall is also boosting the visibility of TechDays on social networks; both before and during the event. This public version of the Sociabble platform aggregates and displays the social media feeds of Microsoft, guest speakers and partners. Integrated directly into the TechDays website, the Social Wall allows all site visitors to view this content and share it on their own social networks at the click of a button. 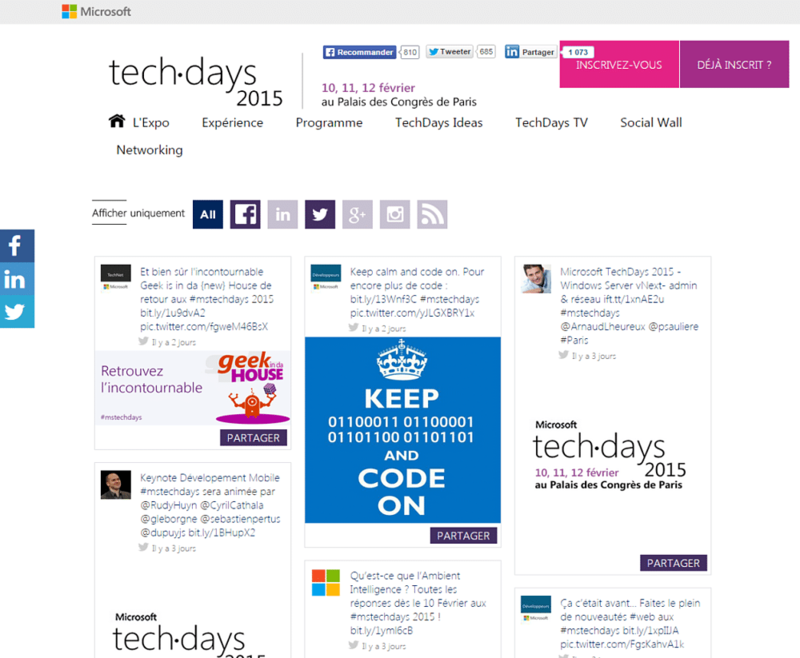 View the TechDays 2015 Social Wall. The posts that appear on the Social Wall are also displayed on a number of screens in the Social Lounge; in slideshow format. Meanwhile, filming is taking place throughout the event; allowing online participants to watch sessions via a live interface. This also includes a live Twitter timeline, Sociabble Live. The tools being implemented at TechDays 2015 were designed to attract an even greater number of participants; both at the Palais des Congrès and online, and to leverage the potential of brand advocacy on social networks. 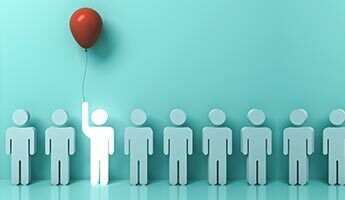 With 38,000 online participants on the first day alone (compared to 17,091 in 2014), Sociabble has helped Microsoft double the engagement levels of previous years. Companies looking to engage brand advocates and showcase their brand on social networks before, during and after events need look no further than Microsoft TechDays. Contact us to find out more about the Sociabble for Events solution.